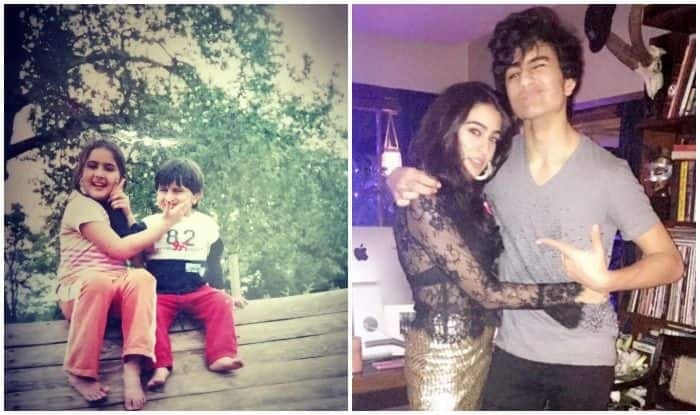 From Innocense to Glamour: Sara Ali Khan's Instagram Post With 'Not so Little Brother' Ibrahim on Siblings Day Will Make You Hunt Down Pictures From Your Memory Lane Too! The sun might be out and about but Sara Ali Khan‘s latest pictures are surely brighter than the day as the Simmba star posts memories with brother Ibrahim on World Siblings Day. From looking like bundles of joy in one picture, to adding all the glamour and shimmers in another one, the brother-sister duo surely looks goals and the viral pictures are proof. Taking to her Instagram handle, Sara shared a series of pictures in which she can be seen clingy to her ‘rock’ brother. While one picture shows the two dollops of cuteness sitting on a slanting roof of a house, holding onto each other’s chubby cheeks lovingly, the following picture looks like a recent one in the backdrop of a cafe, where Sara, dressed in white, can be seen leaning on Ibrahim, dressed in black. The two smiled adorably at the camera and we can’t stop our hearts from melting at sheer simplicity of the two. In the last picture, the duo seemed dressed up for a party night, where an otherwise simple Ibrahim smiled funkily for the camera, pointing at his sister who cuddled and leaned on him. Sara captioned the love-dripping post as, “Happy World Siblings Day to my not so little brother #brotherandsister #bestbro #rock #alwaysandforever” (sic). On the professional front, Sara Ali Khan made her Bollywood debut with Kedarnath where she was seen with Sushant Singh Rajput. Post that, she released her next film Simmba, where she played Ranveer Singh’s love interest. Sara is currently gearing up for Imtiaz Ali’s Love Aaj Kal sequel alongside Kartik Aaryan. Sara Ali Khan had earlier revealed in several interviews that she has a huge crush on Kartik Aaryan but recently the actor said, “If you knew all the thoughts I have but don’t do anything about, I promise we would get over this Kartik Aaryan thing”.